Geneva Commons' newly renovated courtyard area, The Green, will be transformed into a winter wonderland during the holidays and beyond. An ice skating rink will open on Saturday, November 17, 2018, at the outdoor shopping center and operate through Sunday, January 13, 2019. Other holiday attractions include Santa’s arrival and annual Christmas tree lighting on Friday, November 23. Monday – Friday from 4:00 p.m. to 8:00 p.m., Saturdays from 11:00 a.m. to 8:00 p.m., and Sundays from 11:00 a.m. to 5:00 p.m.
Prices are $6 for adults, and $4 for children six years old and under. Skates can be rented for $4. Skates with toe picks are prohibited. Geneva Commons is located on Randall Road at Williamsburg Avenue in Geneva, Illinois. 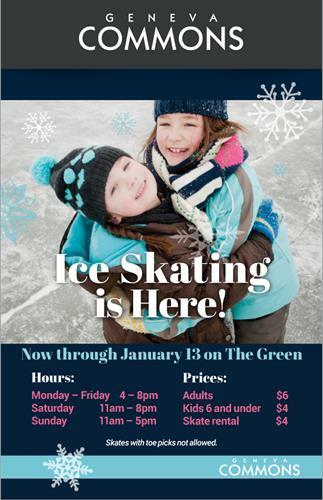 Hours of operation: Monday – Friday from 4:00 p.m. to 8:00 p.m., Saturdays from 11:00 a.m. to 8:00 p.m., and Sundays from 11:00 a.m. to 5:00 p.m.
Skating rink is $6 for adults, and $4 for children six years old and under. Skates can be rented for $4. Skates with toe picks are prohibited.